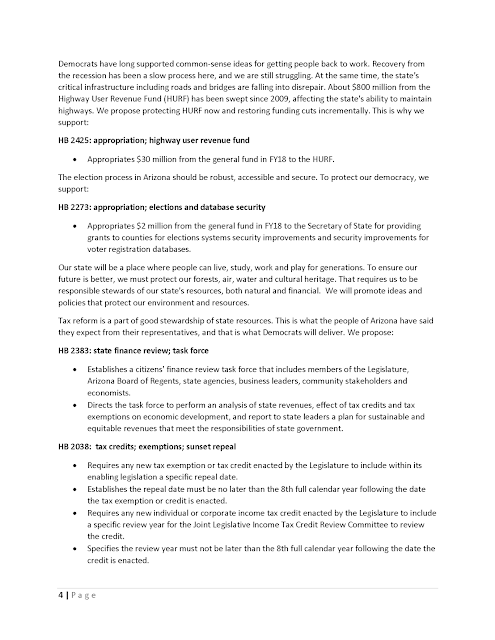 Below are video messages from your House Democrats. "House Democrats stood with community members and stakeholders who are holding the Republicans accountable for both cutting Temporary Assistance for Needy Families two years ago and for pushing legislation that falls short of fully restoring those cuts. To be clear, HB 2372 will punish Arizona children and families as they struggle to recover from crisis. 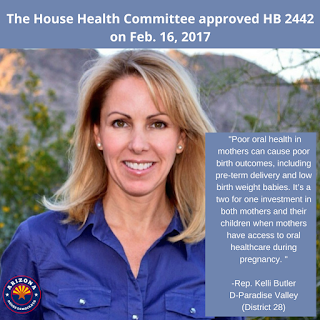 The governor said he was committed to correcting this problem, but tonight he and Republicans fell short of the that commitment and failed Arizona kids. This is a bad deal." Rep. Richard Andrade, D-Phoenix (District 29), introduced HB 2342, a bill that would ensure Arizona Department of Veterans' Services has funding for ten new Veteran Benefits Counselors. To read the bill click here. In a report delivered to House Republicans this week, the House Democratic Caucus outlined a vision for Arizona that is based on community values. The report included budget priorities that would realize this vision while being fiscally responsible. 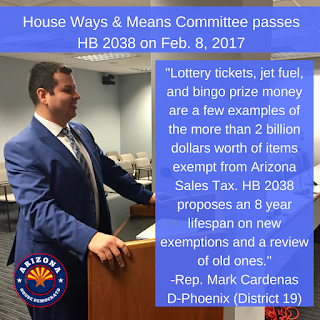 For too long, Republican leaders have avoided real solutions to some of the most pressing issues in our state by using budget gimmicks. 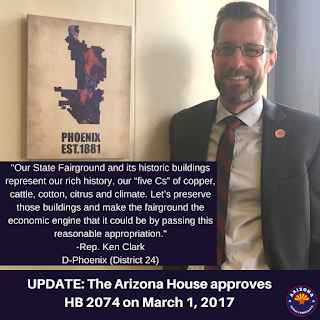 That must stop now. 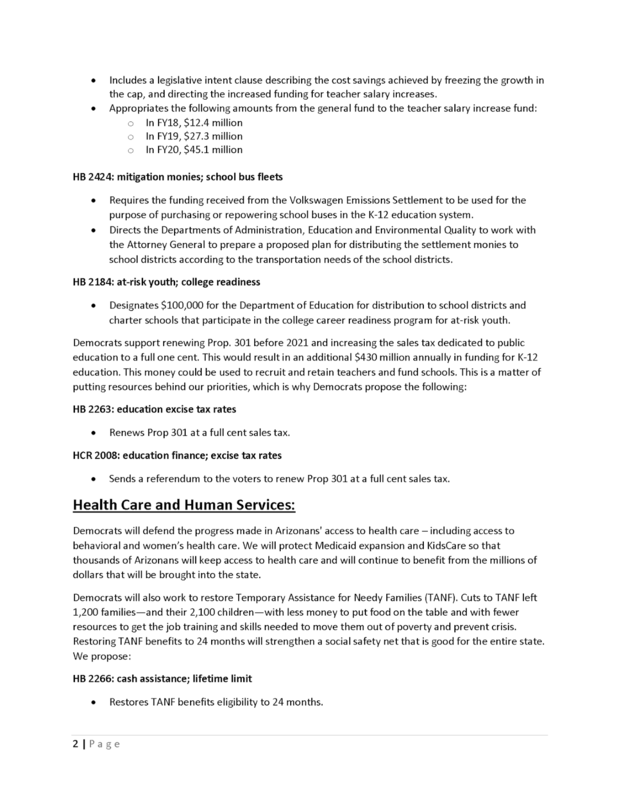 House Democrats have a plan that will move the state in right direction, while forcing legislators to finally focus on long-term solutions for economic stability. Rep. Ken Clark, D-Phoenix (District 24), introduced HB 2055, a bill that requires the county recorder to establish a method for notifying early ballot voters if there is a defect in their ballot materials that will result in it being rejected. 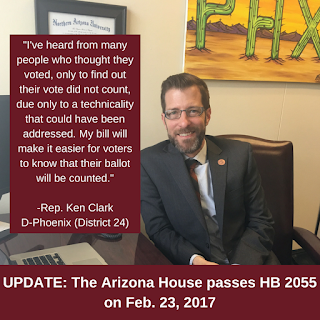 To read the bill click here. Rep. Kelly Butler, D-Paradise Valley (District 28), introduced HB 2442, a bill that requires the AHCCCS to cover dental services for pregnant women who are at least 21 years of age. 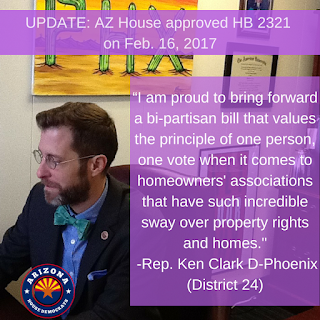 To read the bill click here. 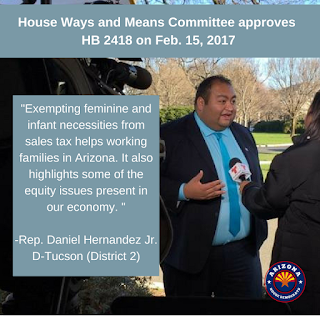 Rep. Daniel Hernandez Jr., D-Tucson (District 2), introduced HB 2418, a bill that exempts necessities such as feminine hygiene products, baby formula, and diapers from the TPT and use tax. To read the full bill click here. 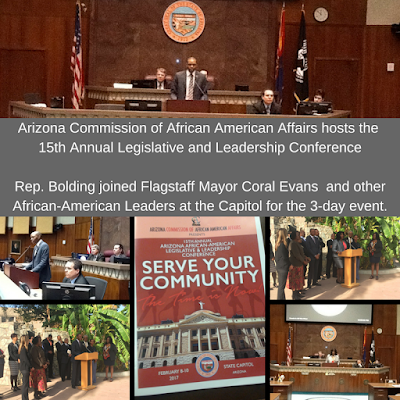 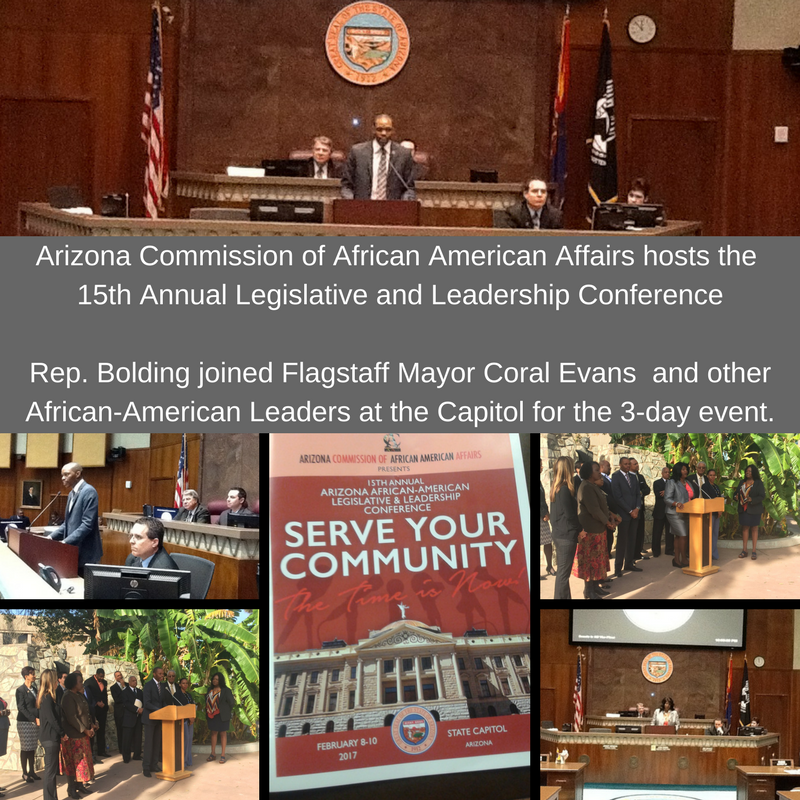 Rep. Kirsten Engel, D-Tucson (District 10), attended The American Legislative Exchange (ALEC) Luncheon. She talks with PAFCO Director Sam Richard about the kind of Arizona she wants to work for, and the kind of Arizona she wonders if ALEC is supporting. 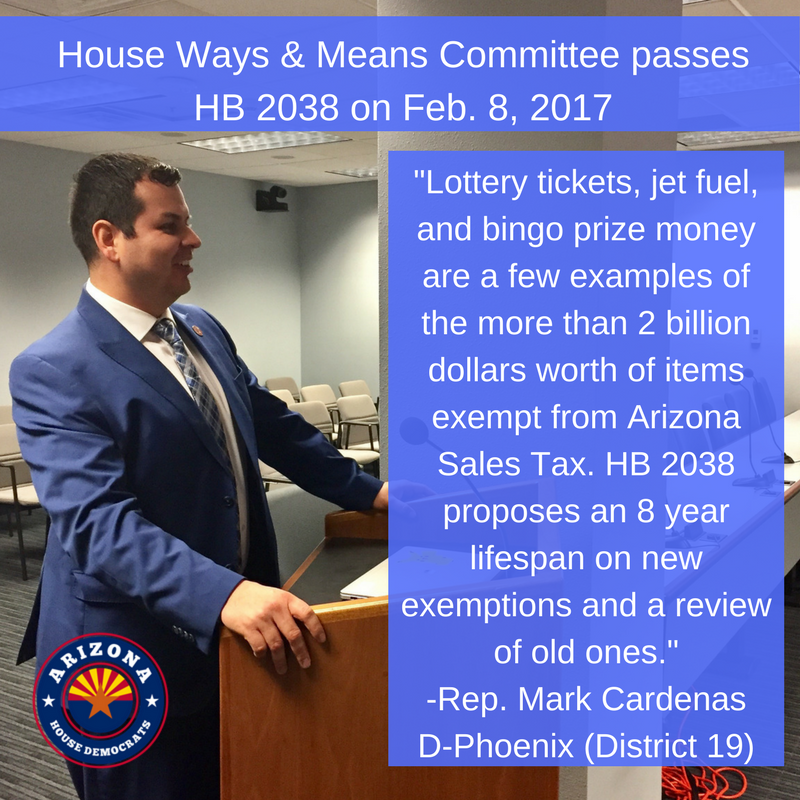 Arizona policies should benefit all Arizonans, not just the rich. 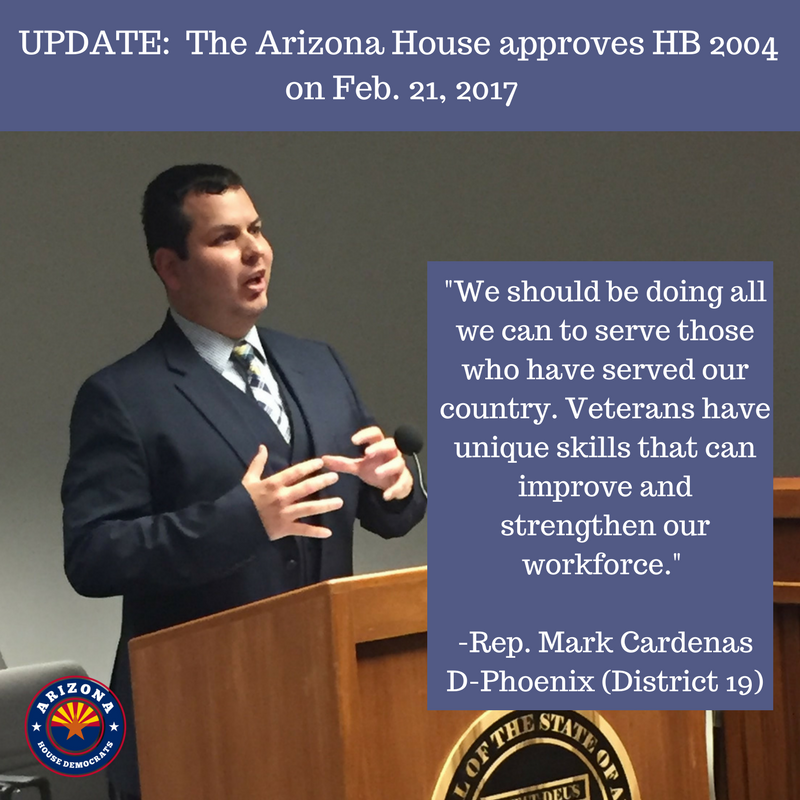 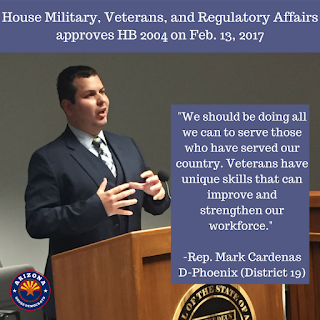 Rep. Mark Cardenas, D-Phoenix (District 19), introduced HB 2004, a bill that supports those who have served our country by requiring the Director of the ADOA to establish a veteran-owned participation goal of awarding state contracts to veteran-owned businesses. 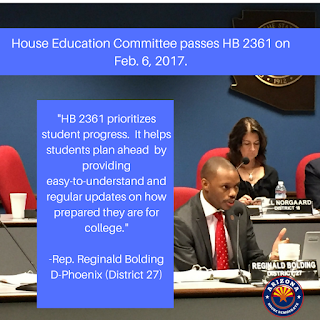 House Democrats are standing with Arizona parents, teachers, and students as we prepare for the oncoming attacks against our kids' schools. 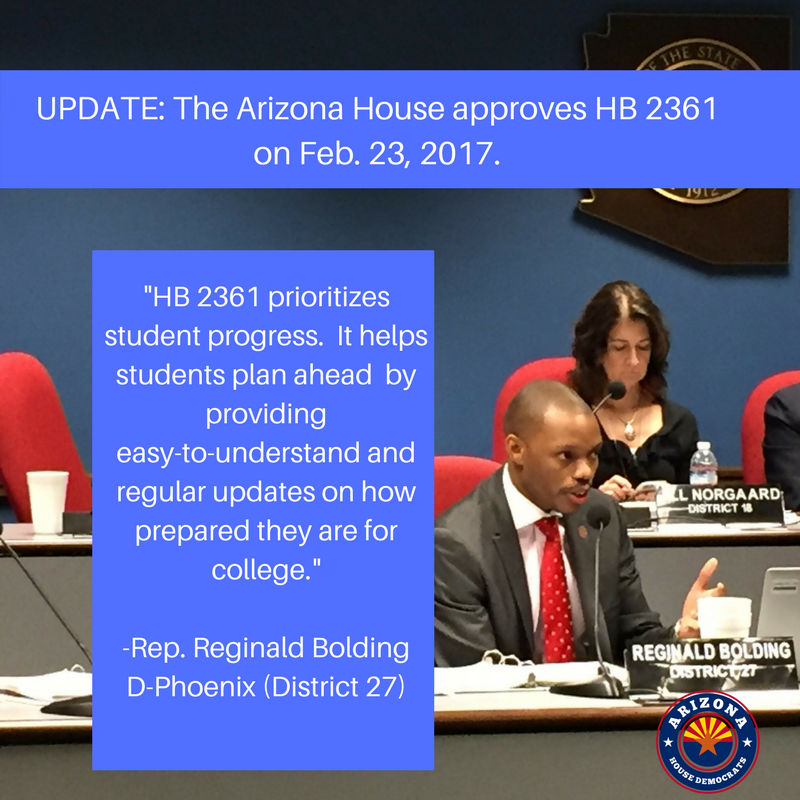 The slow march to drain our kids' public schools of resources is picking up in a very real way. 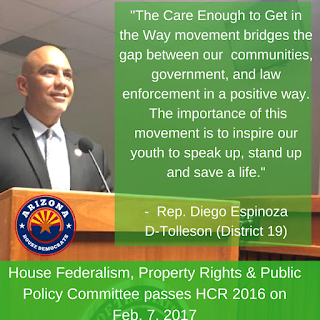 But we are ready and we have a plan to turn things around. This is something we have seen time and time again in Arizona. 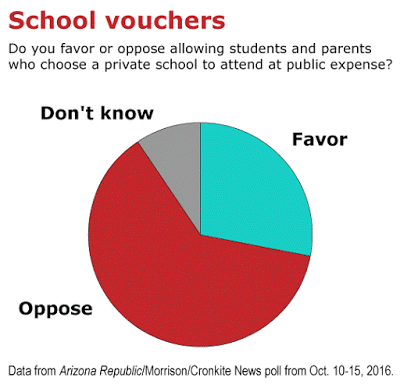 We will continue to oppose efforts from the Republicans to swipe money from our kids' classrooms for private schools through ever-expanding voucher programs. There are several voucher bills being fast-tracked – despite reports that more than $100,000 of these funds were misspent in a six month period. A message from Rep. Isela Blanc, D-Tempe (District 26) and Rep. Tony Navarrete, D-Phoenix (District 30) about HB 2086, the bill that would ban municipal IDs. STATE CAPITOL, PHOENIX – Democratic House Leader Rebecca Rios, D-Phoenix (District 27), released the following statement regarding a federal appeals court decision to uphold the temporary restraining order against the president's travel ban on people from seven Muslim nations. "The 9th Circuit Court of Appeals today acted, as the courts are supposed to, as a necessary check to the constitutional overreach by President Trump’s unlawful and un-American executive order. This decision means that, for now, people seeking refuge from horrific conditions will not be turned away, and that families separated by this discriminatory policy can reunite. Today’s win is just a step in the larger fight for justice. We cannot stop now." "El Corte de Apelaciones actuó hoy, como un cheque necesaria, de el uso exceso de la orden ejecutiva que es ilegal y contra los valores de los EE.UU. 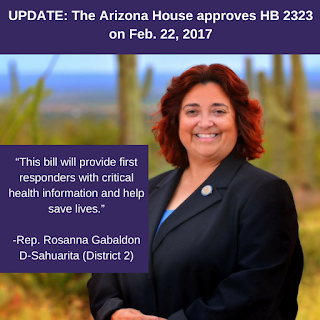 Esta decisión significa que, por ahora, las personas que buscan refugio de condiciones horribles no serán rechazadas, que las familias separadas por esta política discriminatoria pueden reunirse. 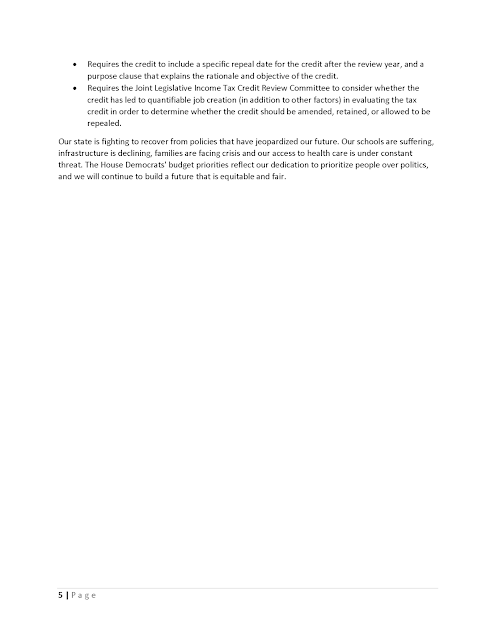 La victoria de hoy es sólo un paso en la lucha más grande por la justicia. 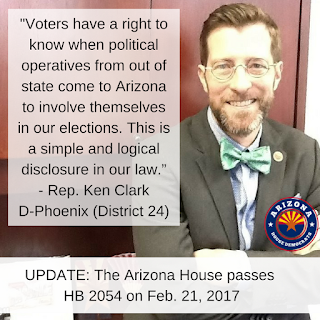 No podemos parar." 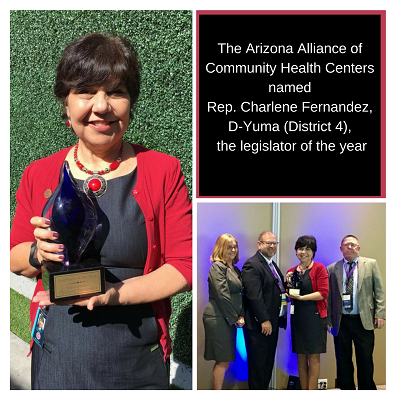 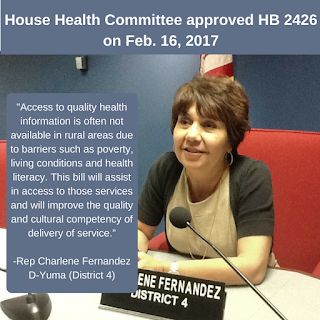 The Arizona Alliance of Community Health Centers recently named Rep. Charlene Fernandez, D-Yuma (District 4), the legislator of the year. Rep. Ken Clark, D-Phoenix (District 24), introduced HB 2054, a bill that requires an out-of-state nonprofit or LLC to obtain a certificate of registration to do business in Arizona before spending money for the purpose of influencing an election in Arizona. Rep. Mark Cardenas, D-Phoenix (District 19), introduced HB 2038, a bill that requires any new individual or corporate income tax credit to be reviewed by the Joint Legislative Income Tax Credit Sunset Review Committee in a timely manner. To read the bill click here. 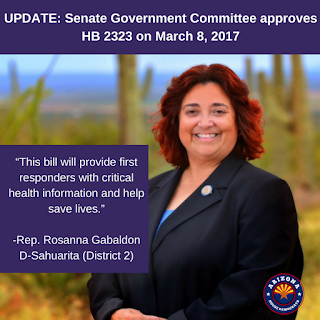 UPDATE: HB 2321 is approved by the Senate and going to the governor! 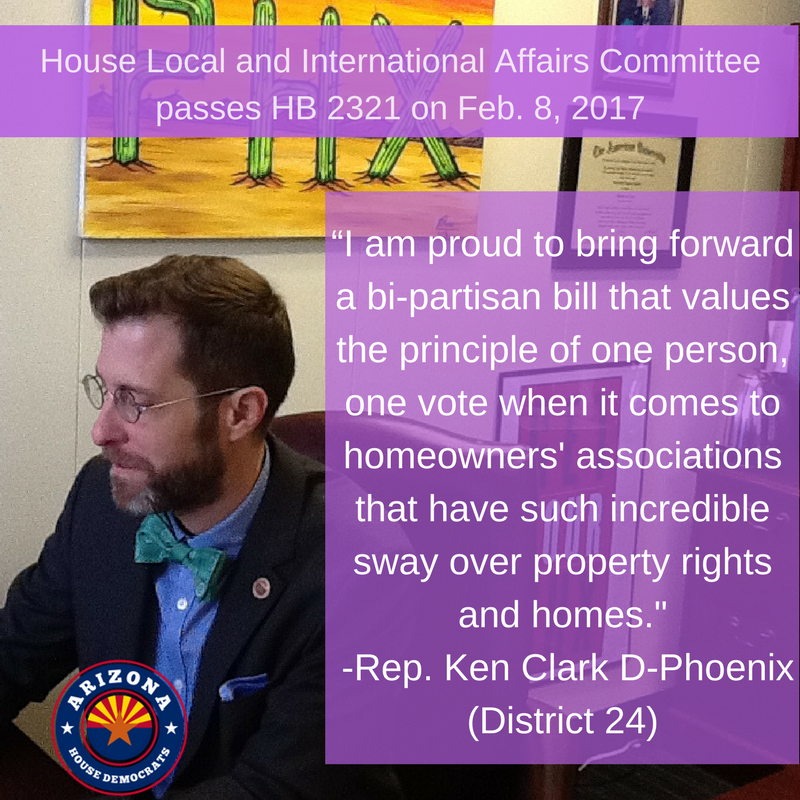 Rep. Ken Clark, D-Phoenix (District 24), introduced HB 2321, a bill that values the principle of one person, one vote by prohibiting cumulative voting in homeowners' associations. To read the bill click here. Rep. Diego Espinoza, D-Tolleson (District 19), introduced HCR 2016, which designates the month of January as Care Enough to Get in the Way month. 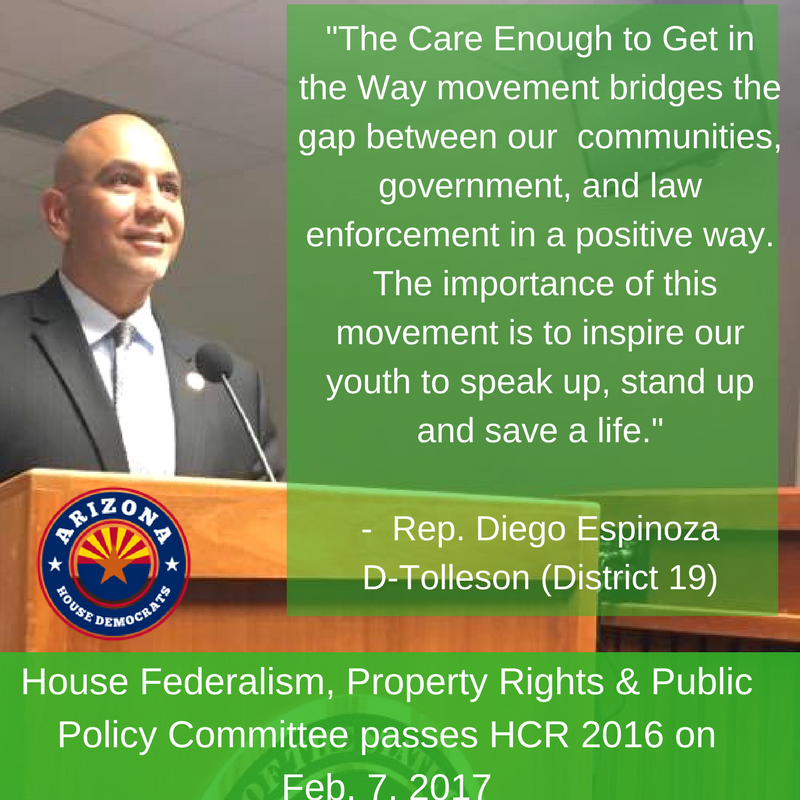 The resolution proclaims that the Legislature supports Arizona students, police departments and community organizations in their efforts to engage in a variety of awareness and prevention activities. 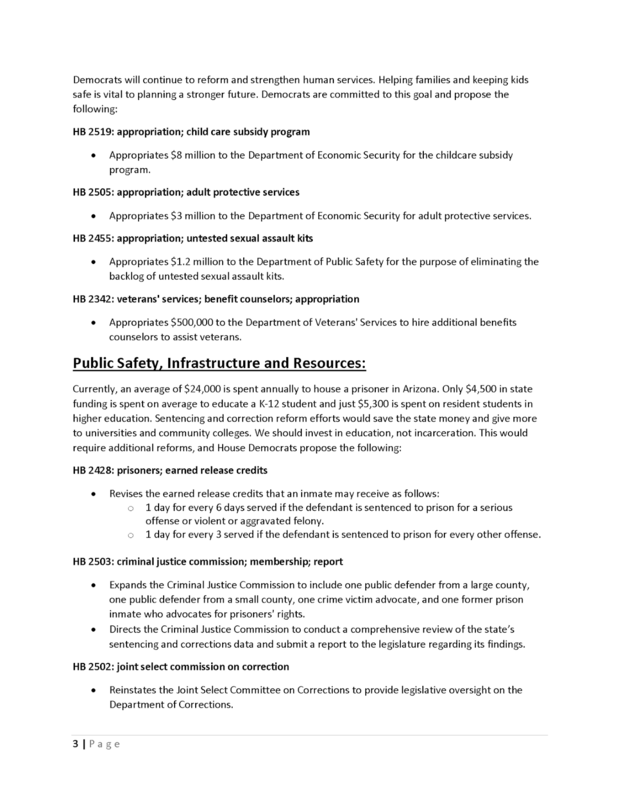 To read the entire bill click here. 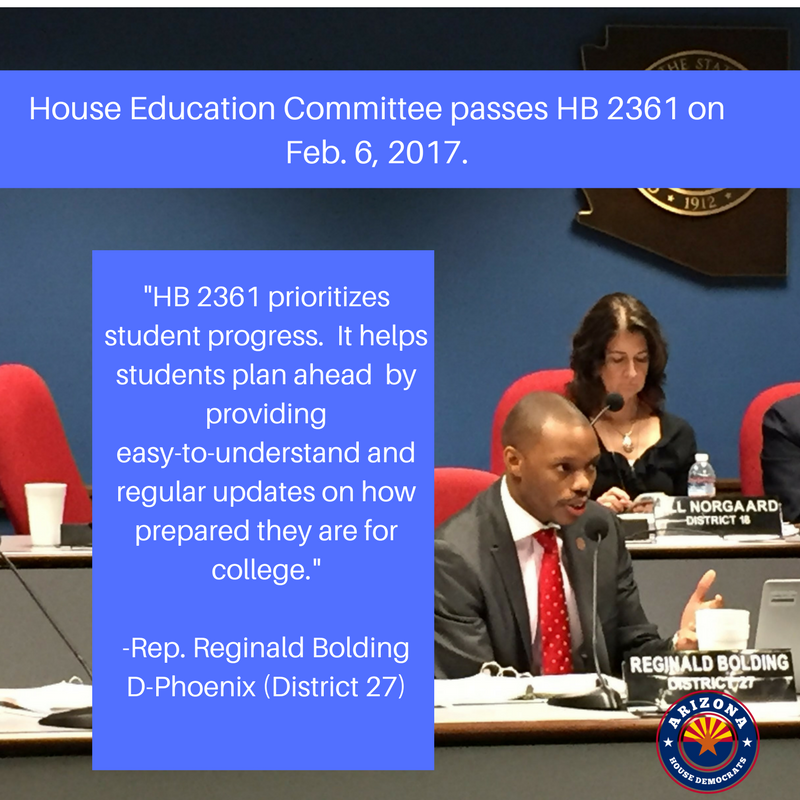 Rep. Reginald Bolding, D-Phoenix (District 27), introduced HB 2361, a bill that would provide Arizona students and parents with regular updates on how prepared students are for college. To read the bill click here. UPDATE: The Governor signs HB 2341! 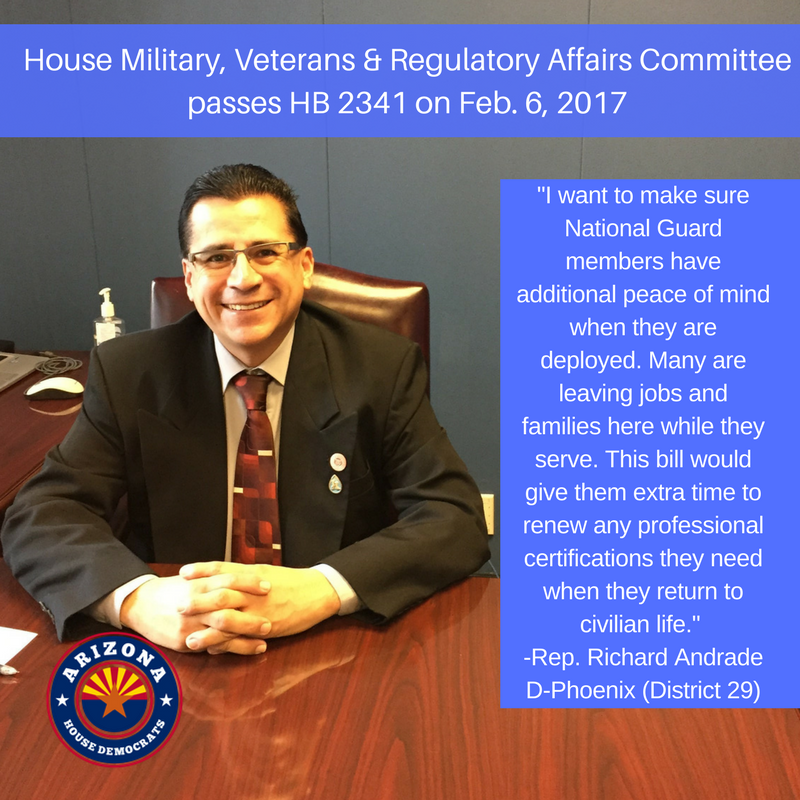 Rep. Richard Andrade, D-Phoenix (District 29), introduced HB 2341, a bill that would extend the period of time to renew any professional certifications armed services members need when they return to civilian life. 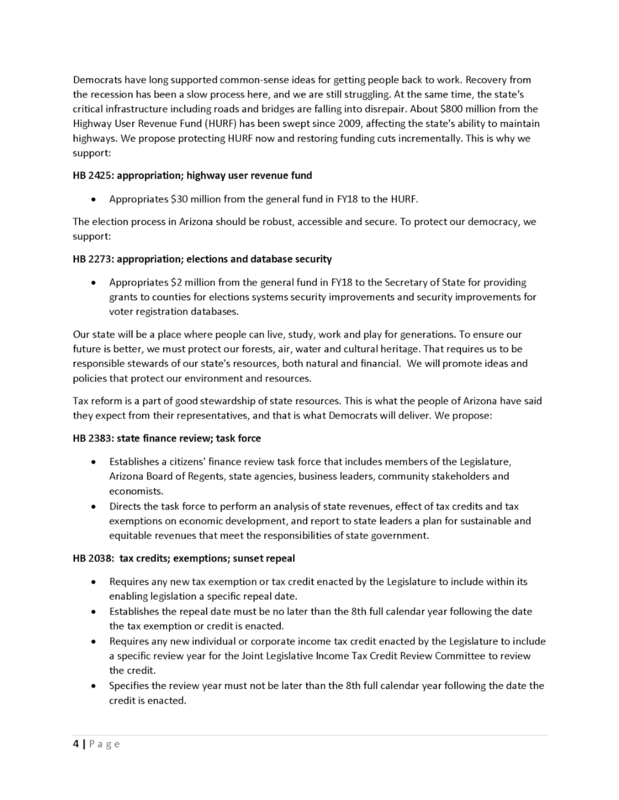 To read the entire bill click here. Rep. Richard Andrade, D-Phoenix (District 29), introduced HB 2342, a bill that appropriates funds to the Arizona Department of Veterans' Services. 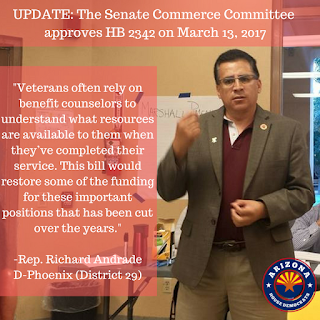 The funds go to hiring counselors that provide counseling and assistance to veterans, their dependents and survivors. 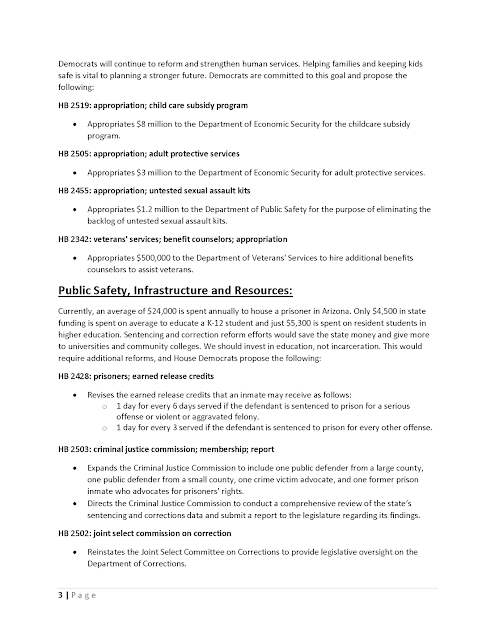 To read the entire bill click here. There is a growing crisis in our classrooms. Arizona is not able to replace the teachers who have been "fleeing" our state. 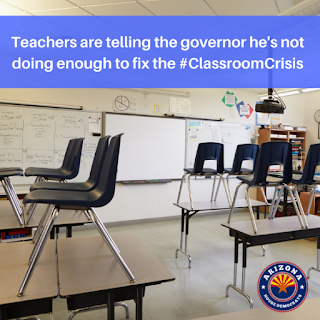 There are thousands of vacant teaching positions in Arizona and educators are saying it's because the salaries here are too low. Arizona is dead last in teacher pay in the country. 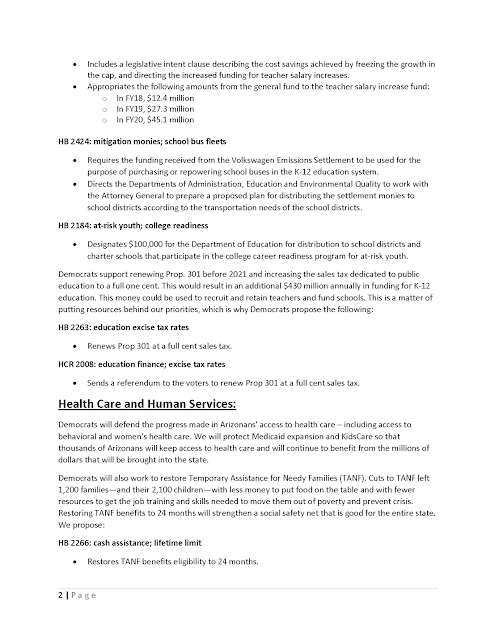 Republican leadership slashed education funding for years, while doling out corporate and special interest tax breaks. 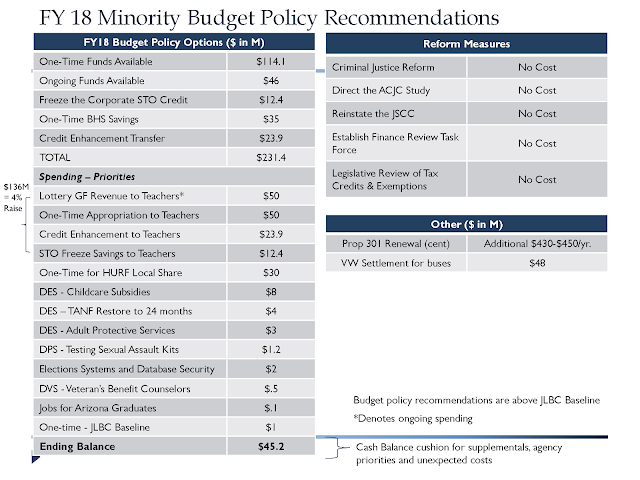 They created this crisis and are now trying to get credit for proposing a minuscule increase in the budget for teachers' pay. 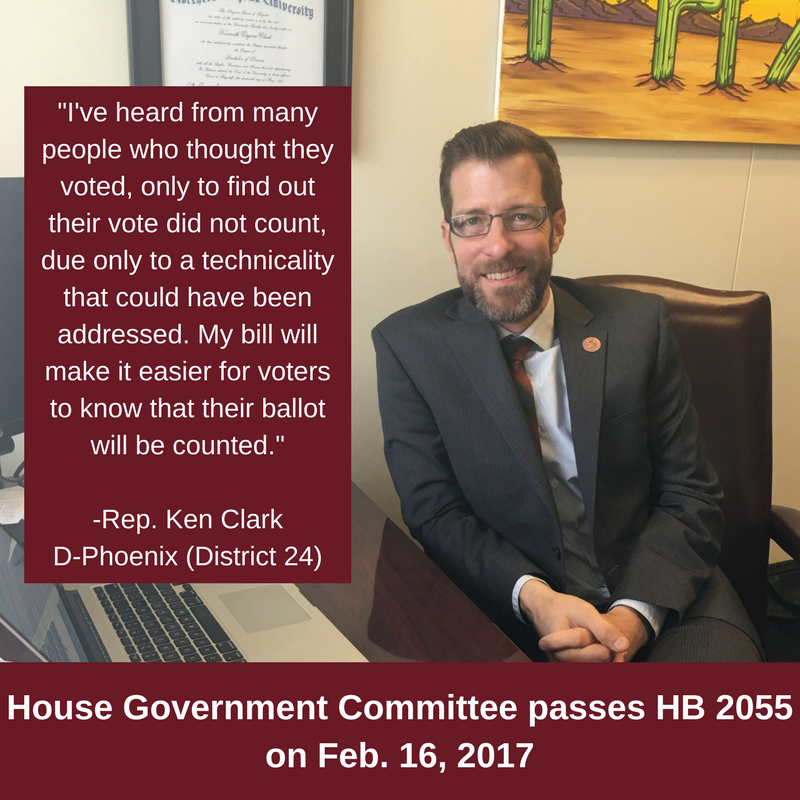 It amounts to less than $200 a year. The offer is insulting. 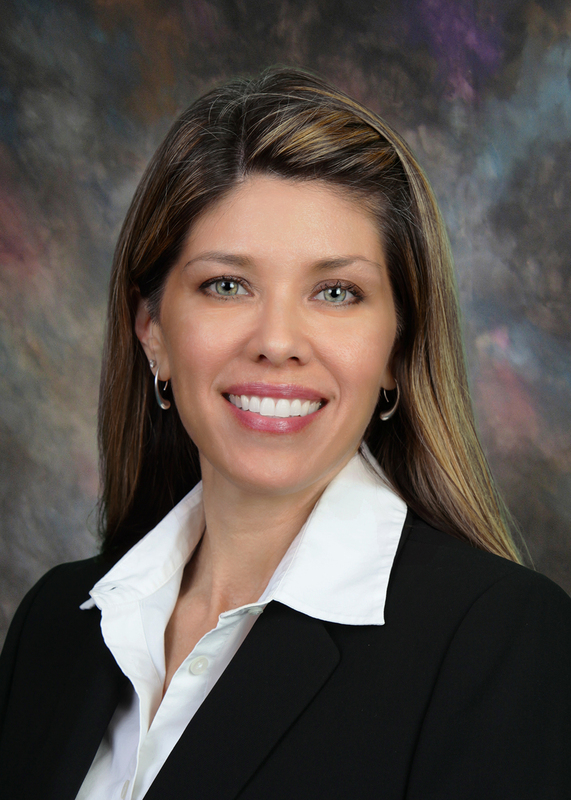 “Quite frankly, I’m afraid (it) is going to have the opposite effect and drive teachers out,’’ she explained. “If they think to themselves, ‘This is what the governor means when he’s going to help education,’ I’m out." 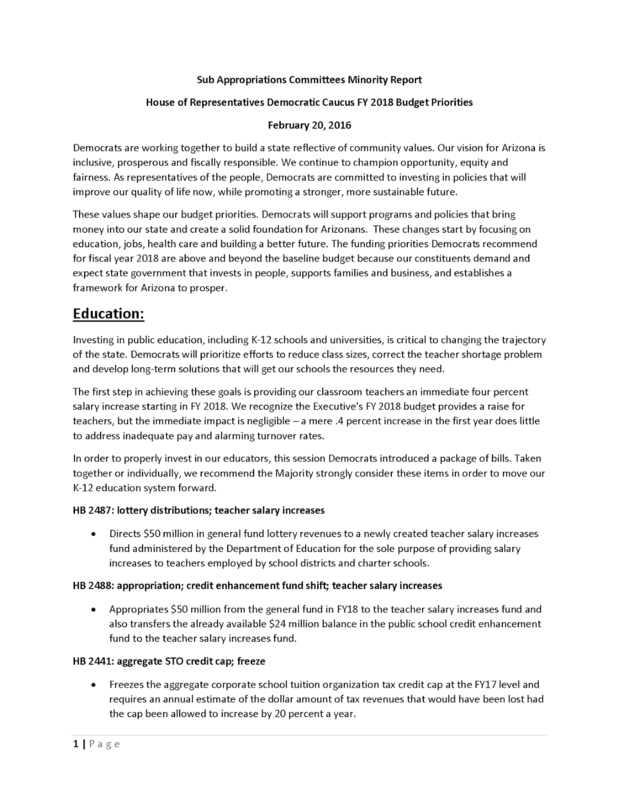 Instead, teachers and other education advocates are calling for a 4 percent raise this year, instead of the 0.4 percent that the governor is suggesting. The governor and other Republican leaders need to take responsibility for the choices they made that have left our classrooms in crisis. 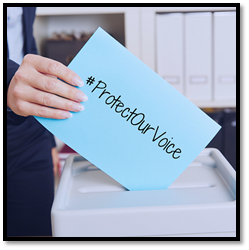 Responsive leadership would empower the teachers who are letting us know how to fix the problem, instead of calling them "crybabies." 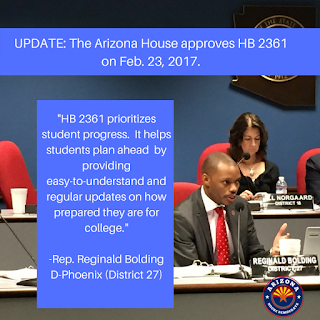 Our kids and our teachers deserve better. Dedicated educators have shouldered this burden for too long. 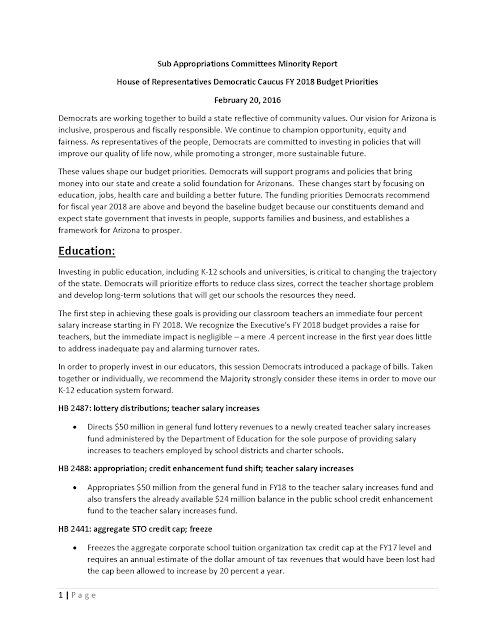 Paying teachers a wage that reflects how much we value the work they do is the right thing to do. To see a copy of the letter education advocates sent to the governor, click here.